so i baked. you know, cuz that’s totally what i do. it’s so easy, it doesn’t scare me at all. ok, none of that is true, except for the part where i baked, but a recipe like this one makes me wonder why i get nervous about anything involving flour. this might be the easiest recipe i’ve ever followed. it helps that we’re talking about a batter here, and not a dough, and that this batter doesn’t really have any rising agents to worry about. popovers, where have you been all my life? and it was so easy, that i’m already thinking about adaptations. that’s right. i’m thinking of playing god with a recipe for baked goods. while this one makes a perfectly fine popover, all brown and puffy, fluffy and soft inside, it’s not as good as this one that sticks out in my memory. last year, at buttermilk channel in brooklyn, i had a hot, airy goat cheese popover that trumped this one. 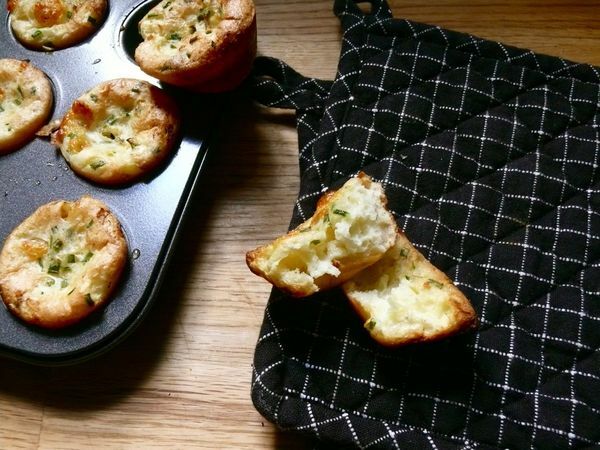 maybe i’ll try to make a popover that combines fresh goat cheese with something sharper like goat milk gouda. or maybe something with even more kick like one with smoked provolone and smoked paprika? hmmm. this new-found confidence makes me feel more like a mad scientist than a competent baker. way more fun. gourmet note: batter can be made 1 day ahead and chilled. 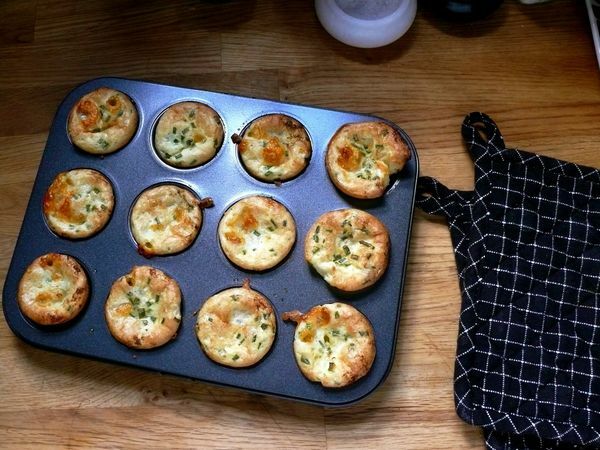 my note: 24 mini-muffin pans aren’t that common. instead of halving the batter, i took advantage of the fact that it can be refrigerated for a day. back-to-back days of hot popovers beats half of them drying out in the fridge. Ah those look so good! I’m actually way more confident baking than cooking. Something about the mathematics of baking that gives me confidence – I was a math geek. Freewheeling in the kitchen scares me. i was a math geek too! well some maths. its the science that scares me…and dough sticking to my hands and not stretching out and all the other monster-like, unpredictable things it can do.